There are three types of harvested ginger: (1) seed ginger, (2) tender ginger, and (3) fresh ginger. Ginger is different from other crops—after seed ginger sprouts and the new plant starts growing, the original seed rhizome is not influenced further by plant growth and remains in good condition when the plant is harvested; its fresh and dry weights have not changed substantially. Seed ginger can be harvested together with fresh ginger before the first frost, or earlier after the plants established fully. The latter is usually called "dig up old ginger" in the north or "steal mother ginger" in the south. The actual method is: irrigate the field on a sunny day and make the soil moist. The next day, insert a narrow shovel or arrowhead-shaped bamboo slices through the side trench and push upward slightly to cut the place of attachment of the seed ginger and new ginger. Then take out the seed ginger and replace the plant back in the soil. It is also possible to remove the surface soil and take out seed ginger directly, and then cover the rhizomes. The root is often damaged by the above operation and is likely to lead to infection by pathogens. Hence, this harvest of seed ginger ahead of harvest time is not recommended. Harvest ginger ahead of maturity in the vigorous growing stage while ginger is fresh and tender. At this stage, the water content is higher in the rhizome, the tissue is tender, and has little fiber and low pungency. The rhizome has not developed completely yet, and hence the yield is low. It is used mostly, for example, in pickling, processing of sugar ginger slices, or acetate-water ginger sprouts. Ginger cannot endure frost, so it should be harvested before the early frost. Three to 4 days before harvest, irrigate the field and make the soil moist, and then dig the whole clump of rhizomes out with a shovel or other tool. Shake off the clay, break or remove stems from the base, get rid of roots, and clean. Then take the rhizomes into the cellar immediately. The fresh ginger just harvested has many wounds and cuts, so it respires vigorously. It has no periderm or perfect protective tissue, so the water content is lost, which causes the epidermis to crumple, and this affects the commodity quality. Ginger has very strict storing requirements. Every ginger-growing area has different weather conditions and a different geographical position; accordingly, different storing procedures are adopted. Storing in Cellar: This is a common storage method. Cellars are holes dug out of the earth in shady or covered places (in places with a higher water table, cellar storage is not possible). The opening of the cellar is about 80 cm to 1 m, and the length 1 to 1.5 m. Cavities are dug on the bottom of the cellar to increase the capacity. The entire cellar is used for storage (Figure 6.13). The cellar should be cleaned before ginger is stored. If the cavities and the bottom are too dry, sprinkle some water to produce some humidity. Then spray some germicides such as 25 percent chlorothalonil, or 50 percent carbendazim (2 gm in 1 l) solution and insecticides such as 80 percent dichlorvos (1 ml/ 800 ml water). Then, spread wet sand about 5 cm thick at the bottom of cellar, put the ginger rhizomes into the cellar, arranging them from the inside to the outside. Leave a space of 30 cm from the opening of the cavity. Figure 6.13 Diagrammatic sketch of ginger storing cellar. 1. Tube-shaped passage. 2. Vent. 3. Ginger. 4. Entrance of storing cavity. The cellar's entrance is left open or is covered loosely with net in order to let in air. Ginger respires vigorously and releases a large amount of heat and carbon dioxide, making oxygen seriously deficient in the cellar. After 20 to 25 days, when the CO2 concentration becomes normal, the entrance to the cellar can be covered with bricks or earthen bricks, leaving a 20 to 30 cm2 blowhole. When the temperature dips low, the entrance of cellar also should be air proofed with slab stone. It is usually done in the last 10 days of November in the north and the last 10 days of December in the south of China. Storing in Rectangle Horizontal Pits: The climate in the south of China is warm, and the water table is shallow, so a horizontal cellar can be used. Dig a rectangular pond 2 m deep and of appropriate length depending upon the quantity of rhizomes to be stored. The bottom should have a slight slant. Then dig a drainage channel separately at both sides. Ginger can be packed layer by layer from the higher end. Cover each layer with moist and fine sand until to about 50 cm from the ground. Finally, cover the top with a layer of fine sand (8 to 10 cm thick) on the top. Insert a few hollow bamboos or other tubes into the cellar for gas exchange. Then cover with wooden sticks as a rafter, and spread corn straw or other crop's stalks on it, and seal up the top to a level higher than the ground. When it is cold, block the entrance of the cellar and the bamboo tube holes tightly with straw (Figure 6.14). Storing in Tunnel: In mountainous area or upland, a tunnel can be used to store ginger. 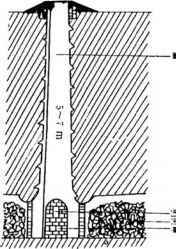 Dig a tunnel (2.5 to 3.0 m long, 1.8 to 2.0 m high) in the hillside. Then dig the short tunnels on two sides and pits at the bottom. The storing method is the same as those of a cellar. Seal the entrance of the tunnel tightly in winter. No matter what kind of method is used, the temperature in the cellar or tunnel must be kept to 11 to 13°C and the humidity at about 90 to 95 percent. If the temperature is higher than 15°C, ginger may easily sprout, whereas if it is lower than 10°C ginger easily freezes. If the humidity is too low, ginger loses water, which causes the epidermis to crumble; whereas if it is too high, the cellar may accumulate water, which is not favorable to ginger. Ten days after rhizomes are put into a cellar, the epidermal cells begin to undergo suberization. After 1 month, the suberization process will be complete, forming a phellogen-like layer. At that time, wounded rhizomes heal up, the top of every rhizome turns round and smooth; this is called "rounding head" (see Figure 6.15). After that, the rhizomes can be stored and transported more conveniently. Figure 6.14 Vertical section sketch map of rectangle horizontal cellar. 1. Entrance of cellar. 2. Base of cellar. 3. Aerating bamboo tube. 4. Ginger. 5. Moist sand. 6. Covering branches, bamboo poles, straw layer. 7. Top soil. Figure 6.15 Sketch map of "rounding head" of rhizome. 1. Longitudinal sketch map of rhizome top. 2. Rhizome configuration before rounding head. 3. Rhizome configuration after rounding head. (1) Scar of the fallen aerial stem. (2) Remnant of the aerial stem. (3) Leaf sheath. (4) Suberization layer. (5) Vascular bundle loop. (6) Thin-walled tissue of pith. (7) Epidermis. Ginger storage is influenced by its water content and other factors. 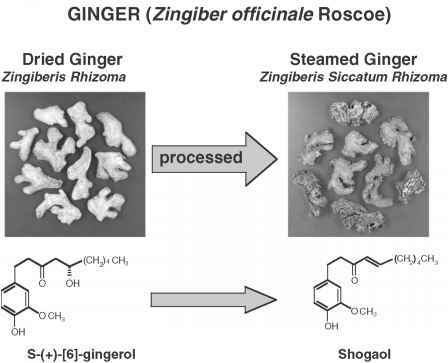 Processing becomes another good method that can prolong the ginger preservation period. Processing into products can not only further increase economic profit, but also improve quality and flavor. So processing technology has become more and more important and more and more products have been developed. At present, many processed products are being sold in the market. According to the methods and product characteristics, ginger processing and products can be classified into five kinds: salted products, chow-chow, pickled products, dry products, ale, and juice products. The principle of the salted process is that the water can be separated out of ginger under high osmosis, whereas salt penetrates into ginger and makes it salty. This inhibits harmful microbial activity, allowing ginger to be preserved for a long time. Salted Ginger: Fresh rhizomes are cleaned thoroughly, flayed, surface dried, and then put in salt. The proportion of ginger and salt is 10:3. The jar should be cleaned and wiped dry. Keep ginger and salt in jars layer by layer. Then transfer them from one jar to another every day. Thirty days later, seal the jar up, and the product can be saved for a long time. The product has a fresh yellow color, crisp and tender texture, moderate pungency and salty taste, and faint scent, and it is tasty and refreshing. Salty Ginger Slice: Cut the cleaned and flayed ginger into slices of about 5 mm thick, and sun or bake them to about 10 percent water content. Then salt them layer-by-layer. The proportion of ginger and salt is 10:3 to 3.5. Fifteen to 20 days later, get rid of the surplus salt, dry the ginger slices, and store. Salted Ginger Bud: Select tender rhizomes that are harvested ahead of time, clean and flay them, dip for 3 to 4 days in 20°C brine and dip for 5 to 6 days in 20 to 21°C brine (measured by Baume densimeter). The proportion of ginger and brine is 100:36. Then take ginger buds out and put them into a jar, press tightly layer-by-layer, and pour in 20 to 21°C brine until the ginger pieces are immersed. Add salt on them (add 2 kg salt per 100 kg ginger sprouts). Seal up the jar and allow to bloat for 10 to 15 days. The product has a yellow and white color, moderate hotness, and salty taste. Iced Ginger: Choose fresh and fleshy rhizome pieces, clean and peel the skin, and salt for 15 hours in jars. The proportion of ginger and salt is 100:12. Take them out and cut into leaf-shaped pieces of 3 mm thickness. Then salt them for 12 days in jars; the proportion of ginger and salt is 100:22, and stir once every 2 days to salt them fully. Then take them out and dry to 40 to 50 percent moisture on a bamboo mat. Put them into the former jars and salt again, and then air them until salt frost shows on the surface of rhizomes. Bean Curd Ginger: Clean rhizomes and flay, cut them into thin slices, and air dry. Then salt them with 16 to 18 kg salt for every 100 kg of ginger pieces. Fill them into jars in the form of a layer of ginger with a layer of salt and seal them up. Ten days later, take the ginger pieces out, dry in hot air or under a fan to 20 percent moisture, then knead them to make them crumple and lose water. After that, put them into jars and salt for 2 to 3 days. Then take the ginger pieces out and airdry them for 3 to 5 days. The product appears as soft white pieces. HotJam: Clean ginger and peel off skin, dry in the air, cut into slices, and sun for 1 to 2 days until skins are about 90 percent dry. Wash red peppers, remove stalk, and grind into hot paste. Then put the ginger slices in the paste in the jar, pour hot wine, and salt in a ratio of 100:35:2.5:28. These are packed in jars in the sequence gingerchili paste and salt, layer-by-layer until the jar is almost full. Then pour wine slowly, cover, and seal the jar and store for 20 to 30 days to get the finished product. The principle of the chow-chow process is increasing the sugar content and decreasing the water content of tissue to make a product having higher osmotic pressure, and thereby inhibiting the activity of harmful microbes. The sugar content of chow-chow products must be over 60 to 65 percent in order to achieve a reliable microbe-inhibiting action. Sugar Ginger Slices: Select fresh, tender, and fleshy ginger rhizomes, cut them into thin slices of 0.5 cm thick, half cook (till the slices become transparent) in boiling water, and then cool, take out the ginger pieces and drop them into a water-filled jar. Chow-chow (delamination) them for 24 hours in 35 kg sugar per 100 kg ginger rhizome and then add 30 kg sugar again and boil to concentrate to syrup. Take ginger slices out, air dry, and put them into a wooden trough and mix with 10 kg-powdered sugar, and then sieve and remove the surplus powdered sugar. Thus a layer of white sugar coating sticks to the ginger slices. The product is yellow, has a faint scent, and is crisp, moderately hot, sweet and declicious. Red Ginger Slices: Wash ginger rhizomes and peel off the skin and cut into slices. Rinse in water five to seven times. Then take them out, air dry, and candy them, until the ginger slices become yellow and transparent. Remove the slices and cool them and set the ginger slices in a jar. Add 35 kg sugar and 5 to 8 kg salt per 100 kg ginger. Thirty minutes later, part of the sugar and salt will dissolve and penetrate into the ginger slices. Then heat them at low temperature; some white sugar will congeal on the ginger slices. After that, add 3.5 g edible kermes dye for every 100 kg ginger slices and mix thoroughly. After 25 days, the red ginger slices will be ready. Sugar and Vinegar Crisp Ginger: Wash ginger rhizomes and peel off the skin and salt them in jars. The proportion of ginger and salt is 100:20. Two days later, take them out and let them stand in water for 2 to 3 hours. Then salt once again using a 100:15 ginger-salt ratio. About 60 days later, the semiprocessed product will be ready. Cut the semiprocessed product into slices 2 cm long, 2 cm wide and 0.2 cm thick. Put the slices in clear water for 17 hours, changing the water once in the middle of the course. Remove the slices and wash them with clear water. Then put them into a large bamboo basket and press with a stone for 1 hour, and then pour them into a jar. Pour 2°C white vinegar into the jar and let it immerse the product completely. Take the ginger pieces out 1 day later, drop them in water for 1 hour, and transfer them into basins—fill 0.5 kg in each basin. Then add a little kermes carmine (10 to 30 g dissolved in 3 kg boiled water) and lemon yellow solution (10 g lemon yellow per 100 kg ginger rhizomes). Turn the slices over once every 0.5 hour. Two hours later, put the slices into a jar and let the pigment penetrate them. Then chow-chow according to the proportion of 1:1 (Ginger: sugar). The process of chow-chow can be divided into three steps. During the first two steps, use 35 kg sugar per 100 kg ginger slices each, mix thoroughly, and lay aside for 1 day. In the third step 20 kg sugar is mixed into 100 kg of ginger rhizomes. Four to 5 days later, pour the sugar solution into a pan, heat to boil, and add 10 kg sugar and boil for 90 minutes over a low fire to concentrate sugar solution. Cool the concentrate to 60°C and pour it into a jar and chow-chow for 4 to 5 days. Then concentrate the sugar solution again (60 minutes). After cooling, pour the sugar solution into the jar. Four to 6 days later, sugar and vinegar ginger is ready. Flavored Ginger: Select fresh and tender rhizomes, wash them clean in water, and salt them for 10 to 15 days in a jar (turn over once every 5 days) with 22 to 25 kg salt for each 100 kg of ginger. Take the ginger pieces outside on a clear day and sun them until the pieces get a layer of salt frost covering. Then lay the pieces on wooden boards and pound them with a wooden mallet to make the pieces flat. Combine ginger pieces with 150 g saccharin, 200 g citric acid, 5 kg powder salt, 15 kg liquorice water per 100 kg ginger, mix thoroughly, and keep in the jars for 1 to 2 days. Then take the pieces out of the jars and dry them until a layer of salt frost covers the surface of the ginger pieces. Sauce-Made Process: In this process the semifinished salted product is dropped into soy sauce or other sauces brewed from beans or wheat to allow it to absorb the flavor of soy. Then the product has a special color and delicious flavor and taste. The salt in soy or other sauces is germicidal and helps in preservation. Pickled Ginger Slices: Cut salty ginger products into thin slices of about 0.5 cm thick, add 105 to 110 l water per 100 kg slices, and soak in jars for 2 to 3 hours to desalt. Turn over once every 30 minutes, decant water, and this is pickled for 3 to 4 days with hot sauce using 60 kg sauce for every 100 kg ginger slices. Then remove the sauce and keep for 3 to 4 hours, and then put the pickled ginger slices into jars and pickle with 115 to 120 kg watery sweet soy sauce per 100 kg salty ginger. Ten to 25 days later, the pickled ginger slices are ready. Pickled Ginger Bud: The material used to prepare pickled ginger bud is salty ginger bud. Select fresh and tender salty ginger buds, cut them into thin slices 1 cm thick, soak in clear water for 2.5 to 3 hours in a jar, and turn them over once every 30 minutes to make them desalt evenly. Then take them out, drop in clean water, and leave them for 4 to 5 hours. Remove the slices and pickle for 3 to 4 days with cooked sauce (use 60 kg sauce per 100 kg ginger buds) to get rid of part of the hot flavor. Take them out and allow the sauce to drain off for 3 to 4 hours, and put them into the jars, add 115 to 120 kg watery sweet soy sauce per 100 kg ginger buds, and pickle for 7 to 10 hours. Then take them out, add thick soy sauce, 6 kg powered sugar, 100 g monosodium glutamate, and 15 g sodium benzoate for 100 kg ginger buds, and soak for 4 to 5 days. The product is ready. The principle of the dry process involves decreasing the water content of the product to a lower level so that microorganisms cannot decompose and multiply in the product. The enzymes present in ginger rhizomes will be killed, and such dry products can be preserved for a long time. Ordinary Dry Ginger Slices: Clean and peel off the skin of the ginger rhizomes, and then air dry, and cut them into slices of 0.5 cm thick. Add 3.5 kg salt for every 100 kg fresh ginger slices, and pickle for 3 to 5 days layer-by-layer. When the salt dissolves and penetrates the ginger slices, take them out and dry in the air or in an oven. The dried product is the dry ginger slice. In general, every 100 kg fresh ginger can be made to yield 15 to 20 dry ginger slices. Dehydrated Ginger Slices: Clean ginger and peel off the skin, air dry, and cut into slices 0.5 cm thick, and put into boiling water and rinse for 5 to 6 minutes. Then take them out and cool by washing in clean cold water. After that, spread the slices out evenly on trays and dry in an oven. The drying temperature should be changed from low to high; usually, from 45 to 50 to 65 to 70°C. Bake for 5 to 7 hours. When the ginger slices appear neither soft nor burnt and the water content reaches 11 to 12 percent, they can be removed from the oven and dried over a fire. Pick out the impure products and crumbs, put the quality products into plastic bags, and seal the bags. This product can be preserved for about 2 years. Common Ginger Powder: Clean ginger and peel off the skin and then cut it into diamond-shaped pieces of 1 to 2 cm, dry in an oven and grind into powder. This common ginger powder can be preserved for a long time. It can be further sieved to produce fine ginger powder. Flavored Ginger Powder: Grind the dehydrated ginger slices into powder, add 1 percent natural carotene, 1 percent glutamic acid sodium, and 6 percent powdered sugar, and mix them evenly. This product is sold as a flavored ginger powder and can be packed in plastic bags and sealed to preserve for a long time. Ginger Oil: Ginger oil is usually extracted by distillation. The process of extraction involves cleaning the ginger rhizomes, washing in water, grinding to a paste or cutting into small pieces, and distilling. Steam distillation is used. The oil distills out with the steam. The oil that is distilled out becomes condensed and collected and oil is separated from the water. 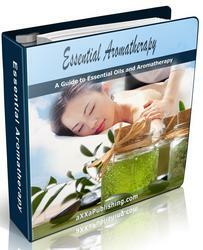 In general, 100 to 300 ml of oil is extracted per 100 kg rhizomes. Ginger Juice: Clean ginger rhizomes, dip into clear water having 1 percent soda for 5 hours, take them out and wash in water, cut them into 2 to 3 cm square pieces. Squeeze juice with juicer. Heat squeezed juice to 95 to 100°C, then fill the juice into 250 ml bottles or cans and evacuate to 0.02 to 0.03 mPa, seal, and cool. Such vacuum-bottled juice can be stored for a long time. How to store zinziber rhizome? How to store ginger after harvesting? How to keep ginger for long time for cultivation? How to handring and storing the fresh ginger after harvesting?